The teeth whitening industry has been rapidly growing over the past decade and shows no signs of slowing down. In fact, it is now the most requested dental treatment in the United States. Many Americans believe that a whiter smile can have a positive impact on the outcome of job interviews, dates and success. Even without today’s social pressures, a white smile has always been a sign of youthfulness and good health. However, many whitening products can come at cost. Many products trade off tooth sensitivity or gum irritation for great results. At worst, some can cause irreversible damage to enamel, leading to problems such as tooth decay. The Waterpik Whitening Professional Water Flosser makes no such compromises. Waterpik put oral health first and foremost, adding the benefit of whitening on top. The whitening formula contains no peroxide – a common bleaching agent that can cause irritation despite being enamel-safe. It is also more gentle than a typical whitening toothpaste, which are often abrasive. Sound too good to be true? Let’s take a look at how the Waterpik whitening water flosser works and if it really can achieve great whitening results. The Whitening Water Flosser has excellent features. The body of the water flosser uses the same technology as the much-loved Waterpik Aquarius WP-660, while incorporating new whitening technology in the tip and handle. It typically retails at around $20 more than the Aquarius, meaning that the cost for whitening is minimal compared to many other whitening products on the market. 1.) Does the Waterpik Whitening Water Flosser work? There are two aspects to consider when assessing whether the whitening water flosser is effective. Will it improve oral hygiene? > Does it improve oral hygiene? The Whitening Water Flosser utilises the same patented water flossing technology as many of Waterpik’s acclaimed flossers. They work by projecting a stream of pulsating water around the teeth, cleaning hard to reach areas between teeth and even below the gumline. Studies show that pulsating water is more effective at cleaning than a constant stream of water. This water flosser delivers 1400 pulsations per minute for the most effective clean. The Whitening Professional Water Flosser also features massage mode which helps to stimulate gums and also dislodge trapped debris from inside periodontal pockets. This can be invaluable for those suffering with gingivitis, and can help to reverse gum disease. However, not all Waterpik tips are compatible with Whitening Water Flosser. At the moment, the Pik Pocket, Toothbrush and Tongue Cleaner Tips are not suitable for use with it. > Does it whiten teeth? The Whitening Water Flosser is proven to be 25% more effective at removing stains than brushing alone. It achieves this by projecting the water stream through a specialist whitening tablet which contains glycine. This is a mild abrasive that, when combined with the pressurized water, helps to shift stubborn stains in hard to reach areas (view on Amazon). 2.) Is the Whitening Water Flosser safe? The Waterpik Whitening Water Flosser is significantly safer than many other whitening options as it contains no peroxide. Peroxide is safe when used as directed, but can cause issues such as gum irritation when misused. Some water flosser users can experience some sensitivity when water flossing, but this is usually due to misuse. Waterpik recommend that you use warm water, not cold, to help avoid sensitivity. You should also always start at the lowest pressure setting and gradually increase pressure to a level that is comfortable for you. 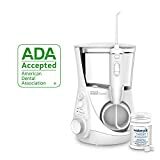 On top of this, the Waterpik Whitening Water Flosser has the ADA Seal of Acceptance. To earn the Seal of Acceptance, there must be proof that the product reaches the ADA’s high standards of both efficacy and safety. 3.) When will I see results, and how long will they last? In a clinical study, the Waterpik Whitening Water Flosser showed a 25% reduction in staining after just two weeks of use (view details). Waterpik recommend using it for a full month for best results. How long results last completely depends on each individual. Factors that influence the longevity of results include the consumption of staining products like coffee, curry and red wine. Results also depend on proper use of the product. Press button to open top. Insert tip through top, aligning the dots on tip and handle. Push firmly to click into place. Fill the reservoir with water. Turn water and power switches on and let all the water run out into the sink. Your water flosser is now ready to use. Load tablet into the top and set pressure to low. Ensure that the water switch is off, before turning the power switch on and placing the flossing tip in your mouth. Lean over the sink and turn the water switch on. Angle the tip at 90 degrees to the gum line and trace along the gums and between each tooth. 4.) Is there something better? The Whitening Water Flosser is a great innovation by Waterpik. No other product on the market combines gentle teeth whitening and oral care together in one simple routine. However, it is important to recognise that it aims to restore natural whiteness of teeth, and not to whiten teeth beyond their natural shade. This means that if your teeth have yellowed due to age, surface stains will be removed but internal discoloration will not. If you are looking for more significant whitening results, consider products like Crest 3D White Whitestrips With Light or Opalescence Go Whitening Kits. However, bear in mind that these products will only be of cosmetic value and will not improve oral health like the Whitening Water Flosser can. *Note: we review the Waterpik Whitening Professional Water Flosser WF-05. The Whitening Water Flosser WF-06 is also available but has limited features. Glycine is the ingredient responsible for whitening. It is a mild abrasive which works with the water flossing technology to remove stains. Those wanting to achieve natural-looking results. At under $100, it represents great value for money, not only whitening, but improving oral health. While you won’t achieve a bleached look with it, the Waterpik Whitening Water Flosser is a great tool to give you a white smile that is confident on the inside and out. Can I use the whitening tablets with other Waterpik water flossers? No – the whitening tablet should be used in a specialist compartment of the Whitening Water Flosser. This mean that the tablets are not compatible with other water flossers. They should never be placed in the reservoir as they can cause damage to your device. Can I use the Whitening Water Flosser without the tablets? Yes. Once you have reached your desired level of whitening, you can continue to use the water flosser without the whitening tablets. Does the Whitening Water Flosser come with EU voltage. No. This product does not have international voltage and should only be used in North America. Do you brush before or after using this product? Whether you brush before or after is down to personal preference. The whitening tablet does have a minty aftertaste though, and many user prefer to floss after because of this. Can I use this with crowns? Yes – the Waterpik Whitening Water Flosser is specifically designed with dental work like crowns, bridges and implants in mind. Is the Whitening Water Flosser safe to use after a professional treatment? Yes – the Whitening Water Flosser is completely safe to use after a professional treatment. It can help to maintain results. The warranty for this Waterpik is 3 years. What is the difference between the WF-05 model and the WF-06? The WF-05 is the Whitening Professional Water Flosser. This shares the same advanced features as the highly acclaimed Waterpik Aquarius WP-660. It does not have massage mode, LED function, a timer or pacer, and is not available with chrome accents. The base dimensions of the WF-06 are also slightly larger than the WF-05.